VRA Update: VRA System Market Internals, Pattern Change. China Outperformance Continues. Investors in Extreme Fear. Good Thursday morning all. While US markets gave up more than half of their gains yesterday, with the DJ closing +157 (from 450 pt highs), we did see a pattern change. Maybe an important one. Check out the internals from yesterday. Better than 2–1 advance/decline and a big 3–1 up/down volume. For our markets to find solid footing and have an opportunity to regain their 200 dma, its important that we have multiple days of positive readings, at least somewhat as good as these. Bottoms are messy but the internals continue to improve (by just a bit). Our pattern of higher lows for the years is still intact but some work to do to get back over 200 dma. Which is my one primary concern about this market. The longer we remain below the 200 dma in our broad market indexes, the more emboldened short sellers will become. Watching closely. We’ve also said consistently that the US-China trade war is not actually a trade war. It’s always been about China opening their markets, legitimately, to the entire world. Long term, both the Chinese people and the entire world will thank Trump. One man…with guts apparently made of steel…all American, through and through. Thank you Mr President. Asian and emerging markets continue to recover. We saw solid, 1% + gains across the board earlier this week. Below is the updated chart we’ve been focusing on; FXI (China ETF) vs SPY (S&P 500). The outperformance of FXI since mid-October is striking. BTW, FXI is now just 5% below its 200 dma. An important component of the VRA Investing System is sentiment, and man is it ever bearish today. This post from the fat pitch blog makes the point well. Market timers are as bearish right now as at any point in history. If you’ve been here for a while, you know that we warn you when the markets are hitting extreme overbought/oversold and when investor sentiment reaches exuberance/fear. We took a combined 135% in net profits in the first quarter of this year for just that reason (AAII hit 60 and our momentum oscillators hit extreme overbought). We are contrarians. When everyone is going right, we want to go left. Lemmings, we are not. If you’re bearish, you’re in the big majority. We do not want to be part of this majority. Below is a 2 year chart of the DJ, but its this years trading we want to look at today. For ’18 we’ve been stuck in one big trading range, from 23,500 to 26,500. Like a ping pong ball, we’ve bounced back and forth all year. Lets take a closer look…I continue to believe the technical positives outweigh the negatives. 1) Sell side volume pressures have declined. 2) Both RSI and MFI have continued to improve, even as the market declined. 3) While stochastics never reached heavily/extreme oversold on this last decline, I’m good with that. The Santa Claus rally was due to kick in…I believe the move higher extends. As we’ve been discussing here, over the last 3 weeks (even as the markets have taken a hit) relative strength in important areas began to improve. One chart we focused on last week was the semiconductors. With the DJ down earlier in the week, the semis went green. What led the way down is now leading the way higher. We want to see tech lead the way out of this correction. Speaking of relative strength, gold has been trading exceptionally well and is now approaching its 200 dma for the first time since June. Short term, its reaching overbought levels, but with the FED about to cease rate hikes and the US dollar topping and reversing, this bodes very well for gold and the miners. At the heart of the global bull market to come will be the worlds transformation from globalism to populism. Its occurring everywhere we look…massive long term positive. And we’re getting good news again on the US-China trade war (it’s not), as China continues to bend to the will of one man…DJT. VRA Market and System Update. In Memory of Pearl Harbor. November Employment Data Soft. NewsMaxTV Interview. Good Friday afternoon all and what a week it has been. Markets were closed this Wednesday for the DC memorial of former President George HW Bush, and today we remember the attack on Pearl Harbor and the 2400 American lives lost. I had not seen the video below until today. If you’ve visited the memorial site in Hawaii you know what a moving experience it is. Thank you to all of our military veterans, past and present, and to those that made the ultimate sacrifice. We’ll never forget you. The November jobs report is out, with a slight miss to estimates of 155,000 jobs created and an unemployment rate of 3.7%. As far as the markets are concerned, it looks like a Goldilocks number. DJ Futures were -180 this morning…went positive... now back down this afternoon. The furious rally higher yesterday, from -800 to -78 at the close, came on the backs of the news we’ve been expecting here, as the WSJ broke insider news from the FED that they will take their boot off the threats of the US economy and will “review their previous rate hike plans, going forward”. We’re still likely to get this months hike…but next year is a different story. The pattern of “higher lows” we’ve been talking about here is still intact. We look to have just had a double bottom. And this news was barely covered yesterday…doesnt fit the MSM narrative. 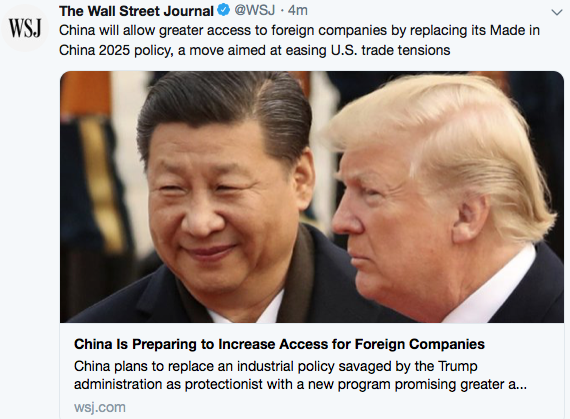 Real progress is being made between the US and China. Obviously, a big plus for US and global markets. One of our biggest macro themes has gone like this; the global reset occurring today…from China trade and business policies to the global transition from globalism to nationalism/populism…is a MAJOR long term positive for both the US and global economies/markets. This reset is setting the stage for a global boom, with the US leading the way. 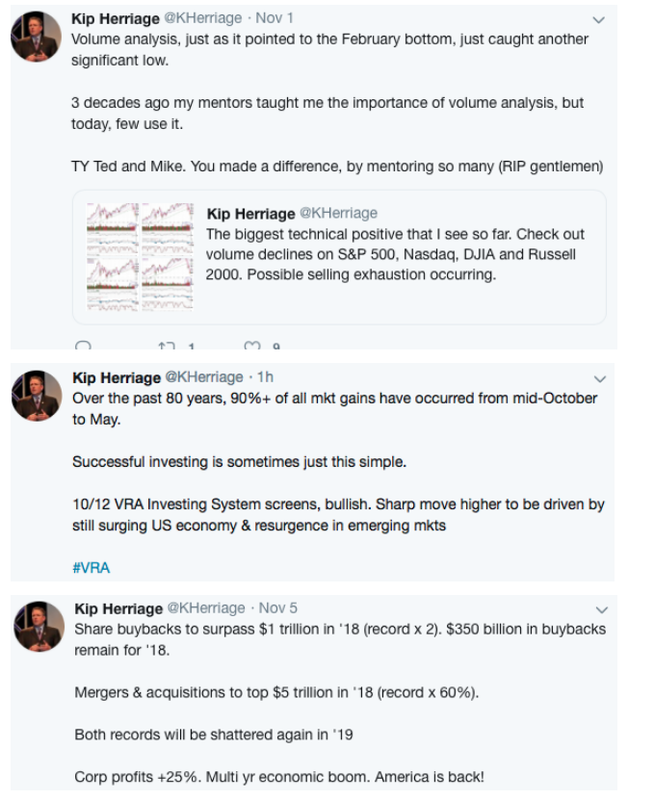 This is a fundamental reason that we have remained positive on the markets, along with readings from the VRA Investing System, which today sits at 8/12 screens positive (gotta get back over 200 dma in our major averages). After Tuesdays 799 point loss in the DJ the bears seemed to come out in full force. The culprit (according to MSM) is the arrest of Chinese tech behemoth Huawei CFO in Canada (with extradition requested to the US). The comparison being made is this would be the equivalent of Apples CFO being arrested by China….aka, not exactly great news for already strained US-China relationship. And this from Ryan Detrick, a solid follow with LPL. 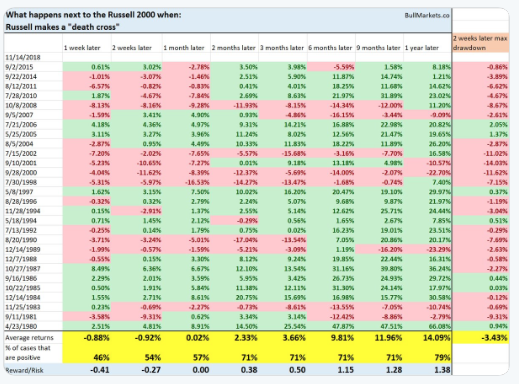 3% losses in December are rare…but not the kiss of death by any stretch. 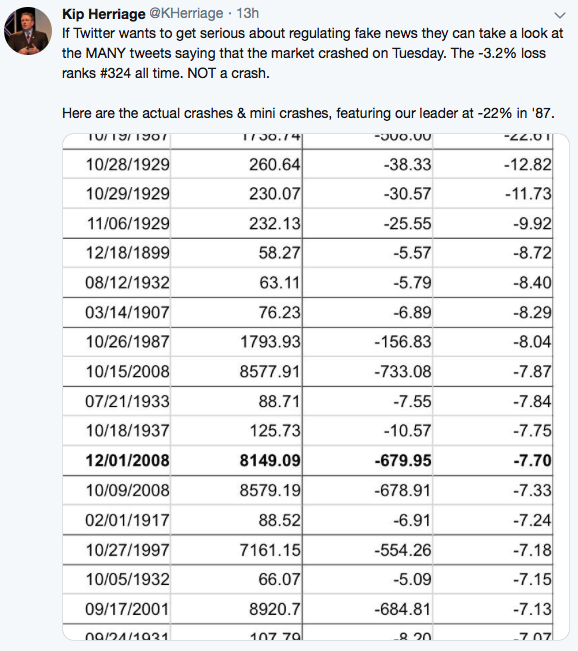 Its important that the DJ level of 24,122 holds…thats the 10/29 lows. We closed at 25,027 on Tuesday and 24,947 yesterday. Market bottoms are typically ugly and a bit scary. Thats what I believe this will prove to be. The Psychology of Investing. DJ Technical Analysis, Bullish. Investor Sentiment, Extreme Fear. Housing is a Buy. Good Friday morning all. What a week. The Fed admits they screwed up and the DJ rallies 1000 points for the week. The 10%+ correction that should never have happened. My mentors (RIP Ted Parsons and Michael Metz) taught me so much about the psychology of investing. The emotions of money…wow. Ted and Michael also taught me the value of being a contrarian. When everyone is bullish, watch out below. When everyone is bearish, its time to buy. Simple, yes. Difficult, hell yes. As of today, only the DJ is above its 200 dma (day moving average). The 200 day is the bible for many/most technicians and trend followers. Its a key to the VRA Investing System. 3) RSI (Relative Strength) and MFI (Money Flows) have continued to trend higher, even in the face of the 10% correction. MFI has been trending higher since May. I find that most interesting…the buyers continued to buy. 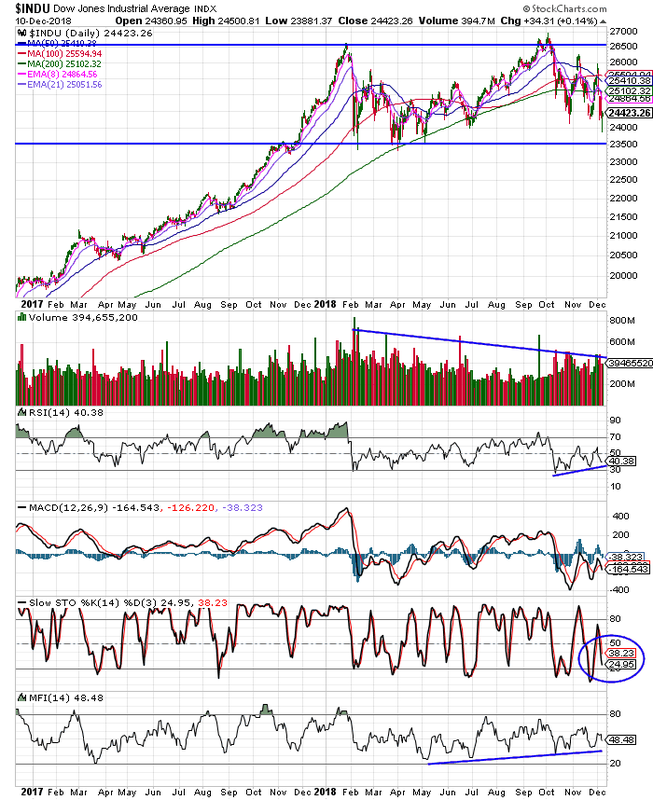 4) Sell side volume pressure steadily declined into the correction. Again, highly bullish (thanks again Ted and Michael…they were big volume analysis guys). 5) MACD just flashed “bullish” yesterday. Bottom line; the DJ has led the way higher. The DJ is made up of MANY co’s that would be impacted by a “trade war” (its not) with China. It appears the markets believe the worst is over….certainly the DJ is giving that signal. Now we need the S&P 500, Nasdaq and Russell 2000 to follow the DJ higher. I continue to expect thats just what we will see. China does not want to repeat the mistakes of Japan. 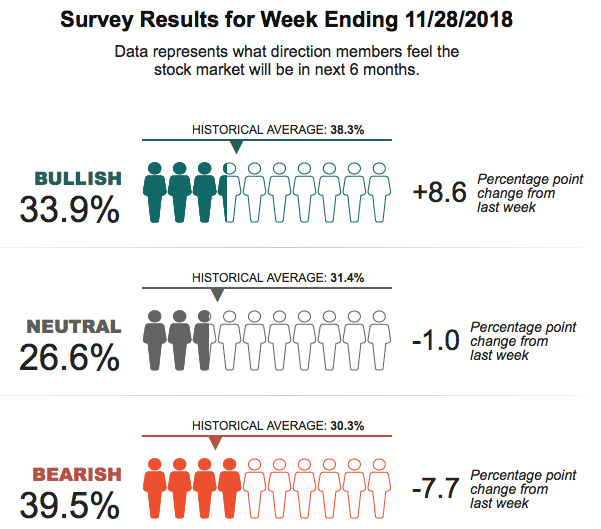 Below are this weeks sentiment surveys from AAII and CNN/Business. 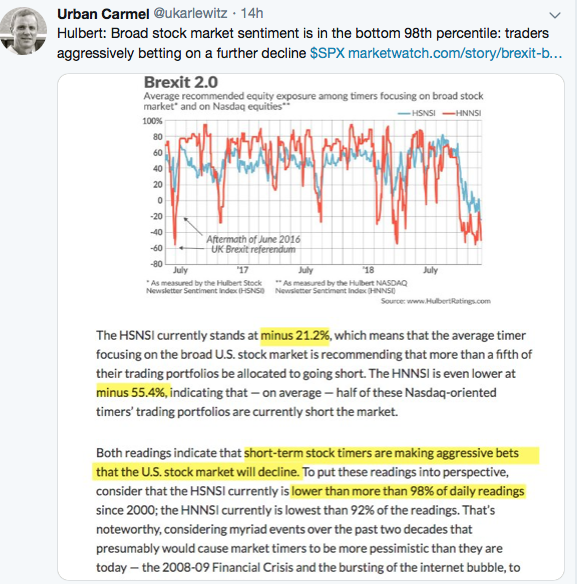 Both continue to tell us that investors are still at “extreme fear”, with AAII showing just 33.9% bulls and CNN/Business showing a reading of 23. 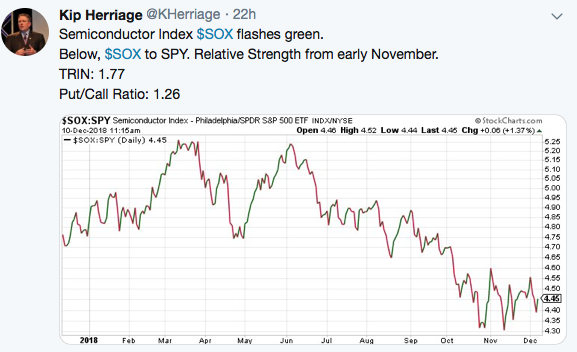 As contrarians, we know what this means…its impossible to by low when everyone is bullish. “How do you feel about the residential real estate market in the U.S. right now. I’m still pretty positive on U.S. residential real estate. We like to look at the world in a simple way. So if you look at the data historically you would say we need about a million six homes being built in the United States. And I think to trailing 12 months we’re at a million 250. Finally for this morning, a macro thought that I believe is important. One that I’ve heard no one else mention. Over most of this year, global equity markets have been battered. They dropped sharply after the January top…and then just kept falling…even as US markets recovered and moved higher. I believe this recent correction in US markets was a “global capitulation”. The strongest always falls last. Now it important that US and global markets continue their recovery. Gotta get back over those 200 dma. Capitulation bottoms are something that I’m very familiar with. My mentors teaching, once again. Here’s the key…the 10/29 lows MUST hold, or it invalidates my capitulation low theory. Just some food for thought. Make sure and login to your VRA Members site to ensure you are positioned properly. And please sign up for our daily after market podcasts at vrainsider.com/podcasts! Until next time, thanks again for reading…have a great weekend. VRA Update: Q3 Earnings, Best in 8 Years. Bull Market Lives On. Oil and Nat Gas. Death Cross in R2K. 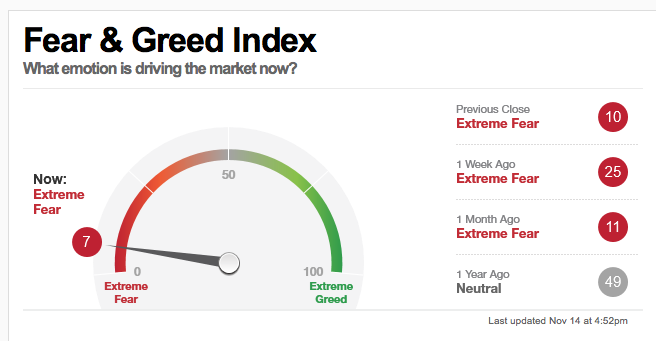 Investor Sentiment Readings — Extreme Fear. Some quick hitters to start the day. - S&P 500 EPS +27.9% (vs Q3 ‘17). This is the single best quarter since 2010. VRA Bottom line: We see NO signs of a slowing economy. Instead, the FED’s 8 straight rate hikes have resulted in a sharp move higher in the US dollar, which in turn has caused headwinds for global equity/currency markets and a slow down in US housing, along with a correction in equity markets, but we continue to view this as a “reset”. A reset that will be followed by the next move to all time highs in US stock markets and a major recovery move higher in global stock markets. Oil has been hit hard…its the most oversold since the late 2015, early 2016 lows. By some metrics, oil is now MORE oversold than when it bottomed below $30/barrel. 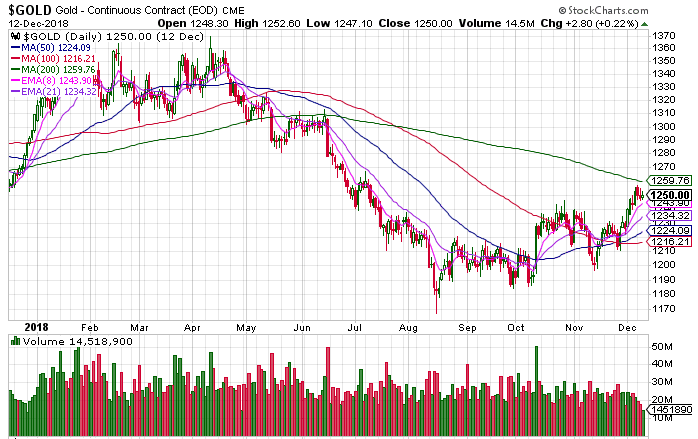 However, know that nat gas has been on fire. The chart below is the very definition of a parabolic move higher. 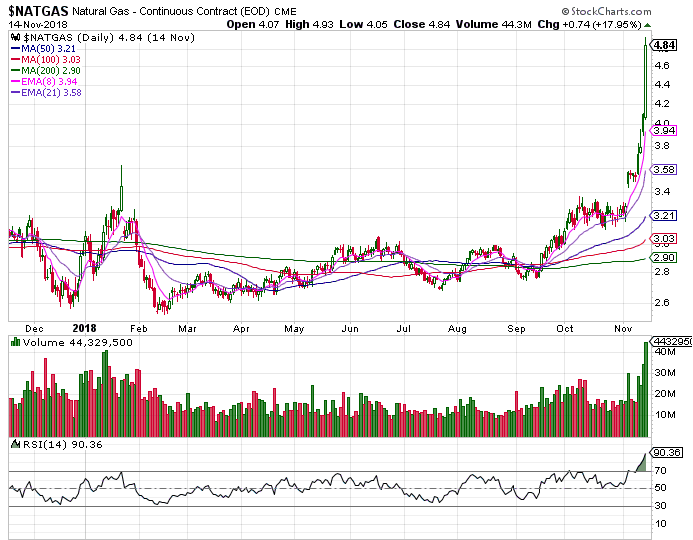 From its Feb lows, nat gas is up a big 64%, a move that has caught traders short gas, while long oil. The move lower in oil is purely technical in nature, produced by traders unwinding their record long positions and then shifting those funds into nat gas. 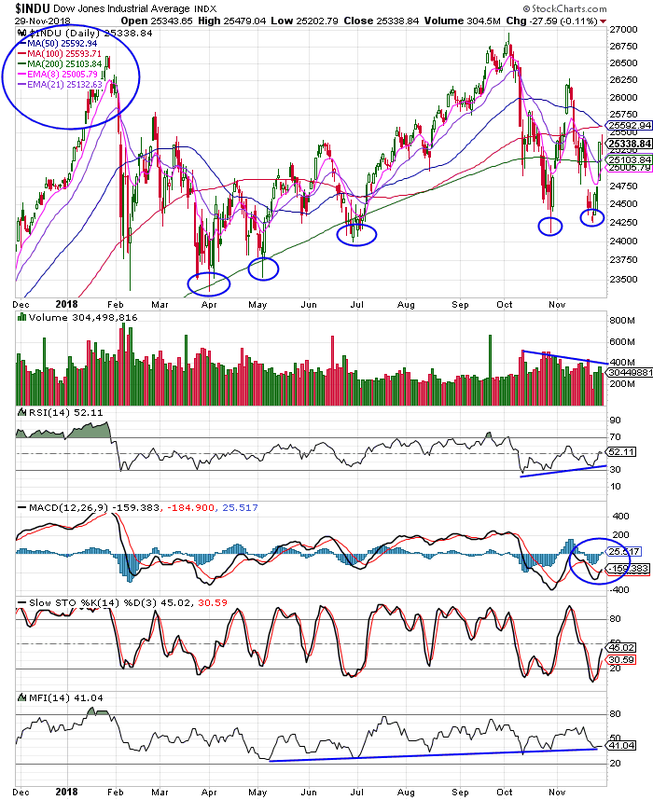 As we’ve discussed this week (and on our daily podcasts, which can be accessed at vrainsider.com), the R2K has now experienced a “death cross”, where the 50 dma crosses over the 200 dma. The inverse is called a “golden cross”. Death crosses have a very real place in technical analysis, but its also helpful to study the analytics of past death crosses. Take a look at the breakdown of all death crosses in the R2K, going back to 1980. Here’s what we see. 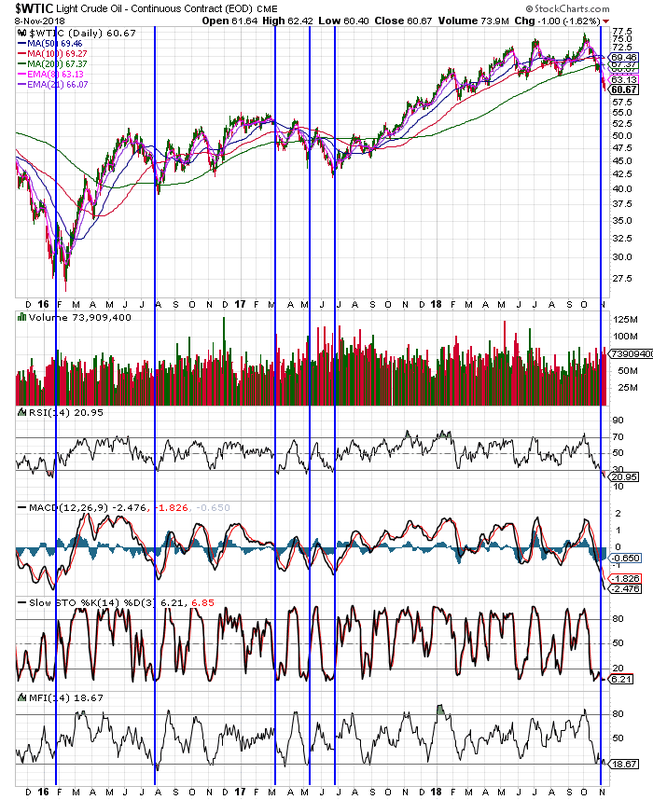 Yes, in the very short term (1–2 weeks), a death cross is (slightly) negative. But take a look at what followed 1 full year later. Average gains of 14%. Not exactly befitting of the name. 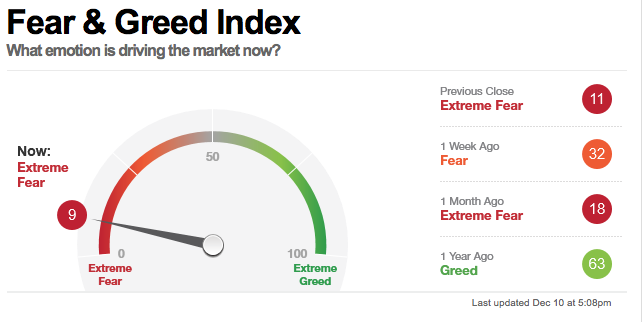 CNN/Money Fear and Greed Index @ 7 (extreme fear). Any time this reading gets below 10, we are “very” close to an important market low and reversal higher. VRA Market System readings tell us that weakness may persist this week (momentum oscillators are currently in no mans land), but as we head into next week (Thanksgiving) the year end Christmas rally will begin to kick in. 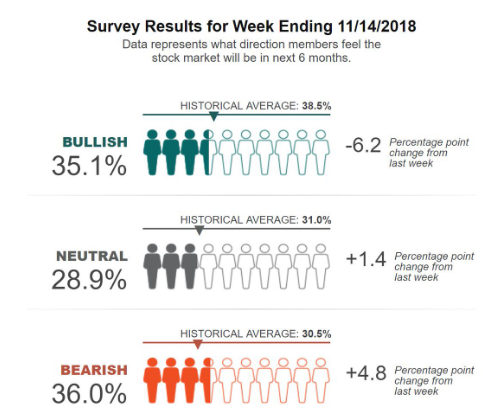 Here’s the weekly AAII Investor Sentiment Survey: 35% Bulls, 36% Bears, 29% Neutral. While the AAII readings have yet to reach extreme fear, here too we see excessive bearishness. 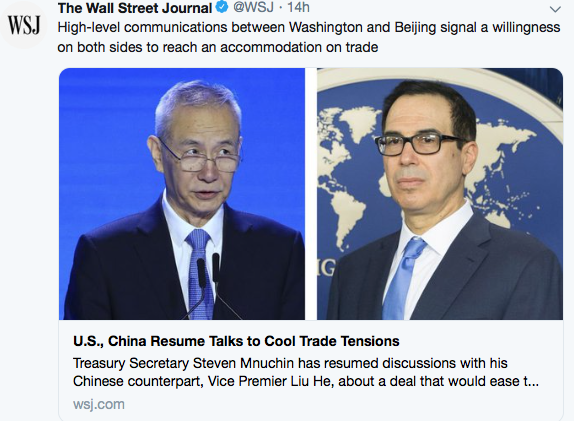 Earlier this week the WSJ reported that US/China trade talks have resumed, at the highest levels. Treasury Secretary Mnuchin is now directly involved. While this has never come close to an actual trade war, the global reset from Trumps trade policy has made its impact felt. We continue to expect a deal prior to year end…very hopefully at the G20 summit at the end of this month. Bottom line: our views really have not changed. While we cannot rule out a retest of the 10/29 lows, we remain positive on US and global markets. VRA Update: FED Minutes, Nervous Nellies. Strong Dollar is the Real Story. More Proof that Markets Love a Divided Congress. Oil Hitting Extreme Oversold. Good Friday morning all. Yesterdays FED minutes spooked the markets…just a bit…as they confirmed their hawkish interest rate policy into year end of into ’19. Here’s the bottom line; the FED will hike again in December. Thats a certainty, making it 9 straight rate hikes. A quick look at this chart of the US dollar tells us most everything we need to know, as it pertains to the strong dollar and action in emerging markets and commodities. A strong dollar puts significant pressure on emerging market currencies and dollar based commodities, which explains much of the weakness these markets have seen in the past year. More Proof that Markets Love a Divided Congress. As we’ve been discussing, the markets actually like a divided congress, as evidenced by the 2% moves higher across the board Wednesday, featuring a huge 545 point move higher in the Dow Jones and an even larger 194 point move higher in Nasdaq (2.6%). Our work in technical analysis (specifically volume analysis and VRA System Internals), combined with ongoing US economic fundamentals told us that the lows were in place, from 10/29 on. Wednesday’s move confirms for us that the train is (once again) leaving the station. Could we have another retest of the 10/29 lows? Sure…anything is possible…but at this point it looks very much to me like we will not have a retest. Analytics and seasonality tells us that it is highly likely that future pullbacks will be light. VRA Bottom Line: US and global equity markets are almost perfectly positioned for a 10–20% move higher, from now til end of Q1. This is how we’ve been playing it…nothing has changed. Here at the VRA we truly love being a contrarian. When everyone is bearish, we tend to be bullish. When everyone is bullish, we become cautious. But today, sentiment tells us that investors are far too negative. This negativity is fuel for the move higher in stocks. Urban Camel is another of our favorite follows on Twitter. Below we see that market timers are as bearish today as they were at the 2/16 lows. This is also exactly when the VRA became ultra bullish. Today, wrong-way market timers tell us that, once again, they’ve likely got it wrong. The commodity chart I’m most interested in today is that of oil. Below is a 3 year chart. The vertical blue lines indicate each instance that oil has reached “extreme oversold” levels…which is exactly where oil sits today. In fact, as of this morning, oil is now as oversold on our key technical/momentum oscillators has it has been since the Jan/Feb 2016 lows, when oil was hitting cycle lows of $26/barrels. The VRA used these exact signals to go long oil/energy stocks once oil traded back up and through $32. Note: over the last couple of months we have been in deep due diligence on a potential new buy rec in the oil patch. The timing of our new buy rec (which will come in the next week or so) looks to coincide with a significant buying opportunity in the underlying commodity as well. Stay frosty. 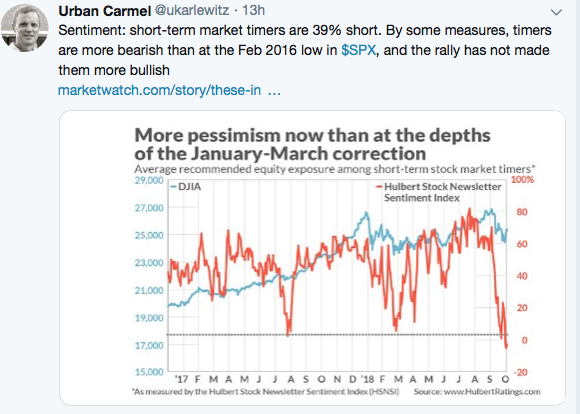 While no one can predict short term moves with precision (only charlatans claim to), US equity markets are poised for major gains over the rest of ’18 and into ’19. Markets love climbing the wall of worry. Next up; as global trade tensions get resolved, emerging markets/Europe will start playing catch-up to US equity markets, further fueling higher stock prices. This is the minority view today…it also happens to be the correct view. One caveat; while the VRA System sits at 10/12 screens bullish, we still must see continued improvement from the internals and each major US index trade back above their 200 dma, right now only the Russell 2000 is the only one still below it 200 dma. I look for this to happen in the coming days.